Why Does Sabbath Matter So Much Anyway? | Truth Is Life! Why Does Sabbath Matter So Much Anyway? Introduction to Bible Principles for Social Justice! SOCIAL JUSTICE 1: Intro Biblical Principles for Why Christians Should Protest Injustice & Take Action! WHY DOES JUSTICE MATTER? 10 BIBLE FOUNDATIONS FOR JUSTICE! Godly Habits for Genius and Great Brains! Truth is life on ordination (and other issues as well)! 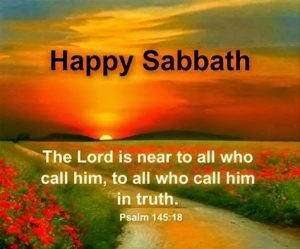 It was to keep this truth ever before the minds of people that God instituted the Sabbath in Eden; and so long as the fact that He is our Creator continues to be a reason why we should worship Him, so long the Sabbath will continue as its sign and memorial. Had the Sabbath been universally kept, the thoughts and affections of humans would have been led to the Creator as the object of reverence and worship, and there would never have been an idolater, an atheist, or an infidel. 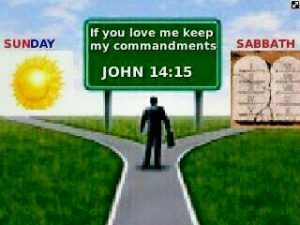 If men and women would acknowledge the true Sabbath, they would not, as they now do, despise the Word of God. The observance of the seventh day would be a golden chain binding them to their Creator. But the commandment which points out who the true God is—the Creator and Ruler of the earth—is dishonored and disobeyed. This is the reason why there is so little stability in the world. The churches have refused God’s sign and misrepresented His character. They have torn down God’s sacred rest day, exalting a spurious sabbath in its place. Oh, that men and women would cease to lock themselves out of heaven by their own perversities.—Manuscript Releases 5:82. Many people wonder why worship on Sabbath is so important. It is important for numerous reasons, since first of all, it points to creation. As many pastors have shown, the doctrine of creation is the foundation of most of the major doctrines of Judaism and Christianity. It explains the origin of life, the origin of sin, why we need a Savior, the beginning of salvation by grace through faith and others. The Sabbath is as Dr. Prager says one of the very most important laws for freedom and strengthening human relationships. 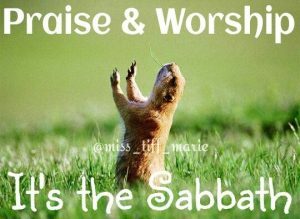 Sabbath is also one of the most crucial foundational truths of God because it is a kind of beacon or symbol that reminds us or connects us directly or indirectly to the most important truths and solutions to problems in our world, including modern problems. When you search through the Bible for the word Sabbath, it turns up in all sorts of surprising locations, often in topics that science shows are extremely important for protecting people from various kinds of deceptions. You know when you go to a supermarket and they set up elevators so that you have to walk past many products in order to get in or out of the store? While corporations make people walk around for profit and sell a mix of substandard natural food and a lot of junk food that is inferior to God’s original food and sometimes quite harmful, God has set up the Sabbath to remind us of the most important truths that benefit our lives and can help us defeat oppressors of almost any kind. “Once truth has been devoured, people swallow falsehoods whole. Without confidence in the concept of truth, listeners are disarmed against lies.” “Truth, A history and a Guide for the Perplexed”, Felipe Fernando-Armesto, p. 165. The main purpose of Sabbath is to remind us of crucial truths so that we will not be exploited by lies. Unfortunately there are many who try to change what God said, something like this. So when you see people changing God’s laws, something God repeatedly warned people not to do (Deut. 4:2, Mark 7:5-13, Jude 3,4, etc.) you can be sure it is for the purpose of exploitation of some type. We need to always keep in mind that all God’s laws are for the purpose of genuine freedom (Ps. 119:44-45, James 1:25), that they are principles that show us how to love God and people (Romans 13:8-10), and that they bring many benefits, not just for eternal life, but also this life (1 Tim. 4:8). A) SABBATH REMINDS US THAT GOD IS OUR CREATOR. Sabbath first and foremost reminds us that our very existence derives from God who created all life at the beginning(Ex. 20:8-11). This is the time that He has asked us to especially show our appreciation to Him, to be part of a community of believers (Hebrews 10:25), to focus on His many unrivaled truths that bring so many benefits and to serve others who are in difficult or are suffering from exploitation and injustice. Sabbath is right in the middle of the 10 commandments, uniting our privilege and duty to love and honor God as our Creator with our privilege and duty to love and serve our fellow human beings as equals who deserve to live a decent life just as we do. And what God asks us to do, always has benefits, often many benefits attached to it. Scientists have find that if you worship God once a week with a community, it brings ~4-14 extra years of life depending on how many of God’s truths you and others around you are following. Not only that, considering time and effort involved, even atheist scientists agree that it is the most efficient way to increase happiness. When we realize that happiness helps us increase our efficiency in work and other areas by ~20-30%, Sabbath becomes quite a profound factor in life success. Sabbath is one of the most valuable and important gifts that God has ever given to us as Dr. Prager explains in this short 5 minute video. Sabbath points to creation which is the foundation of equality for all (Ex. 20:8-11) in contrast to the predicted deception of Darwinism which institutionalizes inequality and injustice. Sabbath reminds us that God is the origin of freedom for humanity (Deut. 5:15) while sin enslaves people (Romans 6:16). “Most of its [Darwin’s “Origin of the Species”] central contentions, such as the idea that everything in nature always evolves gradually, are now disbelieved by scientists, and the science of genetics has made much of it seem merely quaint. …It was the great consolation myth for the Victorian middle classes. Darwin effectively told the Victorians: “Rather than trouble yourself by the gross selfishness of living with vast accumulated unearned wealth, carriage drives, servants and villas, tell yourself that the differences between rich and poor are just the way nature organised things.” This explains its instant bestseller appeal. It also explains why there was a Darwinian revival in the 1980s, with the me-generation all trying to believe in “the selfish gene” as an explanation for why City slickers could earn hundreds of times more than the feckless “workers”, and why the market could make the first world so much richer than the third. In Darwin’s scheme of things, the Victorian rich were the perfect expression of evolution. Darwin’s Greatness is Founded on a Myth. Another scholar, Dr. Harari (who isn’t religious), writes about how the Declaration of Independence (and thus so much of modern history) would have been completely different if it had been based on Darwinism instead of creation science. He is very frank in acknowledging that liberal humanism is founded on monotheistic beliefs, and that evolutionary biologists are conflicting more and more with the tenets of liberal humanism. In chapter 6 of his book, Dr. Harari contrasts two documents: Hammurabi’s Code (written in 1776 B.C.) and the American Declaration of Independence (written in 1776 A.D.). Dr. Harari quotes the most famous line of the American Declaration of Independence and then illustrates how it would change if based on Darwinism. According to the science of biology, people were not ‘created’. They have evolved. And they certainly did not evolve to be ‘equal’. The idea of equality is inextricably intertwined with the idea of creation. The Americans got the idea of equality from Christianity, which argues that every person has a divinely created soul, and that all souls are equal before God. However, if we do not believe in the Christian myths about God, creation and souls, what does it mean that all people are ‘equal’? Evolution is based on difference, not on equality. Every person carries a somewhat different genetic code, and is exposed from birth to different environmental influences. This leads to the development of different qualities that carry with them different chances of survival. ‘Created equal’ should therefore be translated into ‘evolved differently’. Just as people were never created, neither, according to the science of biology, is there a ‘Creator’ who ‘endows’ them with anything….‘Endowed by their creator’ should be translated simply into ‘born’. Equally, there is no such thing as rights in biology. There are only organs, abilities and characteristics…So ‘unalienable’ rights should be translated into ‘mutable characteristics’. And what are the characteristics that evolved in humans? ‘Life’, certainly. But ‘liberty’? There is no such thing in biology. Just like equality, rights and limited liability companies, liberty is something that people invented and that exists only in their imagination…And what about ‘happiness’?…Most biological studies acknowledge only the existence of pleasure, which is more easily defined and measured. So ‘life, liberty and the pursuit of happiness’ should be translated into ‘life and the pursuit of pleasure’. The Sabbath is in a special sense connected to Bible economics/social justice because it reminds us of our Creator and that we are all created equal and to love our neighbors as ourselves (a key trait of stable societies), it is often connected to economic justice in the same chapters where poverty is opposed, it keeps families stable and strong, a key factor in avoiding poverty and economic injustice, it is a time for doing good for those who are suffering and others. The Sabbath as a symbol of freedom is intrinsically connected to justice (Isaiah 58:1-14) and economic justice/land rights for every family which is the ground of stable nations (Gen. 2:8,15, Lev. 25:1-20, Ez. 45:9+, 47:22-23). Sabbath reminds us of a Creator who through prophets opposed greed, the root of all evil(1 Tim. 6:10) and all forms of injustice in over 2,000 verses. Read especially Isaiah 58 and Leviticus 25 for examples of the strong connection between Sabbath and economic/social justice. “The work of Sabbath reform to be accomplished in the last days is foretold in the prophecy of Isaiah: “Thus saith the Lord, Keep ye judgment, and do justice: for My salvation is near to come, and My righteousness to be revealed. Blessed is the man that doeth this, and the son of man that layeth hold on it; that keepeth the Sabbathfrom polluting it, and keepeth his hand from doing any evil.” “The sons of the stranger, that join themselves to the Lord, to serve Him, and to love the name of the Lord, to be His servants, everyone that keepeth the Sabbath from polluting it, and taketh hold of My covenant; even them will I bring to My holy mountain, and make them joyful in My house of prayer.” Isaiah 56:1, 2, 6, 7. Creation is the foundation of all major Christian doctrines such as the origin of sin/guilt (Gen. 3) and the promise of a Messiah to redeem us (Gen. 3:15). Sabbath is a symbol of the sanctuary message which points to Jesus our Saviour and again reminds us that we are all sinners and equally in need of grace (Lev. 19:30; 26:2). Because Sabbath through creation points to Jesus our Messiah, it reminds us of his 2nd coming when all sin and evil will be eradicated forever and the whole world will be made new again. At that time, to praise God for creating us, redeeming us and giving us eternal life and so much more, we will continue celebrating Sabbath weekly in the new earth (Isaiah 66:22,23). C.S. Lewis has written that it is those who think most about eternal life that have done the most good on this earth. And it’s quite logical. If a person is confident that they will live forever in heaven, then they will be much more willing on average to sacrifice time, money, assets, emotional energy and at times even their lives for the welfare of others. History bears this out showing that nearly all of those who pioneered human rights that bring so much good to billions around the world now were believers, especially Jews and Christians. Many cultures around the world also testify to the truth of the Sabbath. Many cultures have words for Sabbath that sound very similar and a long history of believers in God worshipping on Sabbath. 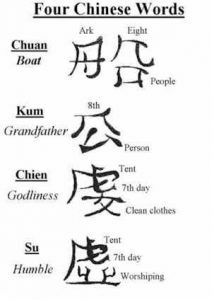 For example, ancient Chinese characters for godliness refer to the 7th day, the Sabbath. It was at creation that God instituted male/female marriage and the family structure(Gen 1:27-8). Many other family structures have been tried throughout history, but all have failed badly. In addition, when people grow up without stable, loving families, they have much higher chances of getting trapped in various kinds of addictions. Sabbath is one of the most valuable principles for improving and enriching family life in history. Sabbath points to Creation which is the foundation of God’s health message (Gen. 1:29; 2:16; 3:2, 18) and has dozens of profound benefits for life. The science of chronobiology has also discovered a circaseptan cycle in nature which shows that people and nature function best with rest every 7th day. So Sabbath itself is healthy. In fact, when France and Russia tried to change the week to 10 days and 5 days instead of 7, people soon became so inefficient in their functioning that they returned to the 7 day cycle. Sabbath points to the importance of caring for the environment and keeping it clean for future generations (Gen. 1:26,28;2:15)..It reminds us that God’s ideal way to live is in a garden (Gen. 2:8). Growing local gardens is one of the easiest and most profound solutions for many modern problems as the illuminating documentary “Economics of Happiness” points out (and also several TED talks here and here). Creation itself of course points back to Sabbath (Gen. 2:2,3) which reminds us weekly that God is our Creator, Savior and source of earthly life, eternal life and all good gifts. The first known animal rights law in history was the Sabbath (Ex. 20:8-11). As living things, animals should be treated with care and compassion. But in addition, many studies have found that when people get into a habit of abusing animals, in time, it can turn into a habit of abusing people***. So Sabbath functions to prevent abuse of animals and people alike. When we remember that God is our Creator who gives everything good to us, Sabbath gives us a special opportunity to praise and show our thanks and gratitude to Him for all He has done (Psalm 92:1). 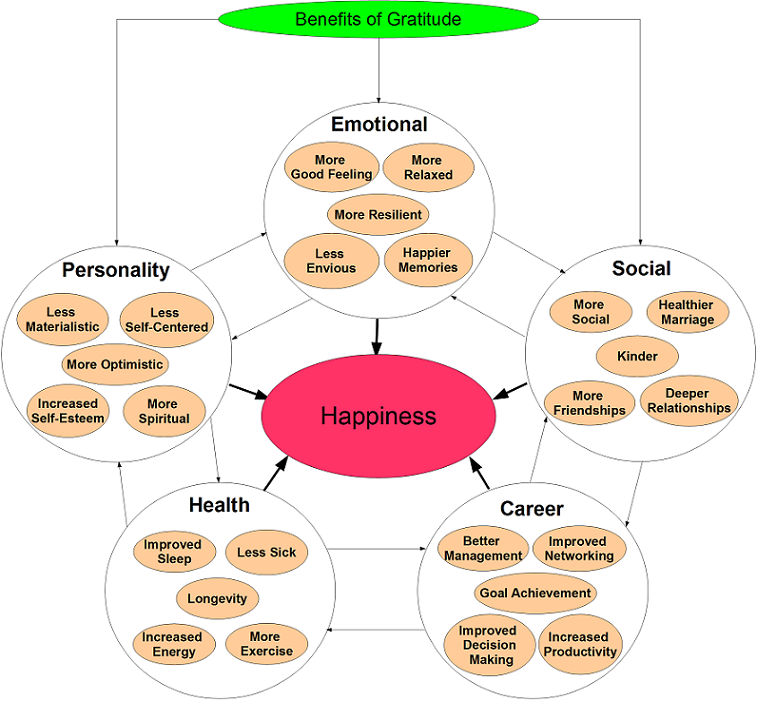 Gratitude is such a simple thing to do, but scientists have found that it brings over 30 benefits to our lives. Sabbath also encourages us to follow God’s example of being loving and generous to others as He has been so loving and generous to us. By performing many of His healings especially on the Sabbath (much to the consternation of the Jews), Jesus demonstrated that it was a special time to focus on uplifting others. “Year after year, more and more studies are highlighting the benefits of generosity on both our physical and mental health. Not only does generosity reduce stress, support one’s physical health, enhance one’s sense of purpose, and naturally fight depression, it is also shown to increase one’s lifespan. The Sabbath is a day for praising and singing in worship (Psalm 92:1) and this also brings special blessings with it. Ellen White said something very important and surprising about the Sabbath. When you see all the truths that Sabbath is connected to and realize that economic injustice is the main factor that causes the rise of tyrants, dictators and atheism, then her comment becomes very understandable. Ellen White said that there will always be new things to learn about the benefits of the Sabbath. So the above are definitely not a complete list of its blessings. 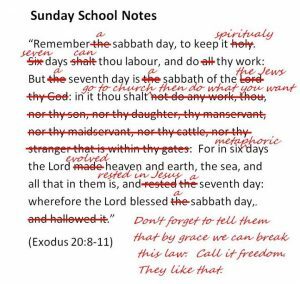 Keep on studying the Sabbath. There are more treasures to discover in this wonderful and freeing truth that God has given us! **Many ancient people beyond Jews were Sabbath keepers. Experiencing how God’s truth energizes life!